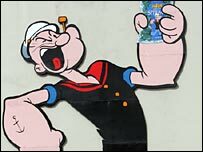 Spinach, noted for making cartoon sailor Popeye strong, may also help to ward off a common cause of blindness. A team at the University of Manchester believe eating the vegetable may protect the eyes from age-related macular degeneration (AMD). 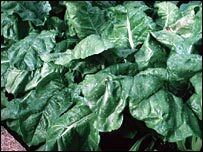 Their theory is based on the fact that spinach, and several other vegetables, contain lutein, a chemical which helps form a key protective eye pigment. The Manchester team plan a study to test their theory. AMD is the leading cause of blindness in western society, and is thought to affect up to 12% of men and 29% of women over the age of 75 in the UK. It is caused by degeneration of the macula, a small area of the retina responsible for seeing detail and colour in the central field of vision. Scientists do not yet understand why some people are susceptible, but do know that the disease is linked to smoking, obesity and poor diet. Lutein is found in sweetcorn, kale and broccoli, as well as spinach. Together with another related chemical called zeaxanthin, it forms an oily yellow substance, called macular pigment, which is thought to protect the macula from AMD. The Manchester team are launching a study on early-stage sufferers of AMD to try to pin down whether premature visual impairment is linked to low levels of macular pigment. Lead researcher Dr Ian Murray said: "Our work has already found strong evidence to suggest that macular pigment provides some protection against AMD, but we want to discover whether eating vegetables rich in these chemicals will have a direct impact on the disease. "Since macular pigment is wholly derived from our diet we would expect that eating foods containing high levels of these compounds increases macular pigment and so helps slow the degenerative process." Dr Murray's lab has developed a lightweight instrument that can measure the levels of lutein and zeaxanthin. Pete Torkington, of the Macular Disease Society, said: "The benefits of a diet high in lutein have been suspected for sometime. "Other factors known to influence macular degeneration include smoking and the damaging effect of blue light on the retina."